SEATTLE – For more than three hours Sunday at Safeco Field, the Seattle Mariners did what they could to lose a winnable game. They gave away outs in the field and ran into them on the bases, once inexplicably when a runner simply walked off the base. A team loses close games like that. The Mariners won this one, 3-2 over the Boston Red Sox, with the two elements that were absolutely vital for a team still struggling to score runs. They pitched and got the most timely of hits. 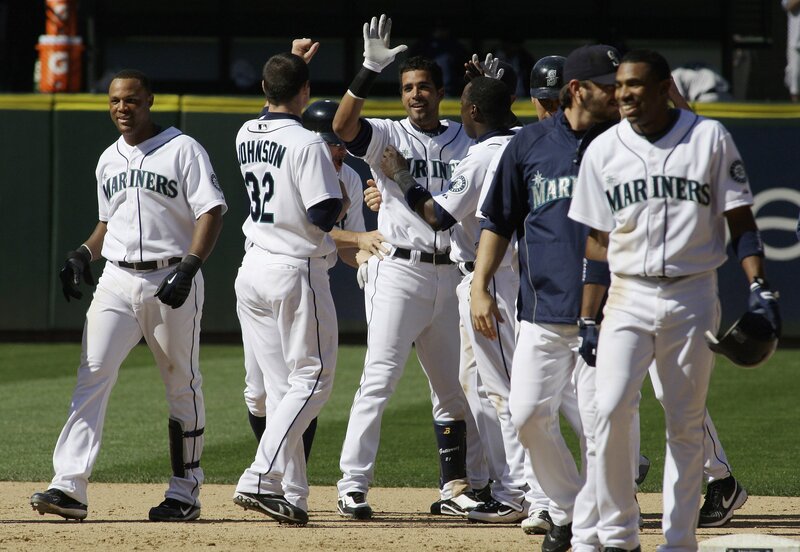 Franklin Gutierrez grounded a single into left field that scored Ronny Cedeno from second base with two outs in the ninth inning to give the Mariners their ninth victory in 16 one-run games this season. That run, along with Russell Branyan’s homer and Cedeno’s RBI triple in the second inning, helped the Mariners win two of three from the Red Sox. Not only that, it took some of the sting from the Mariners’ recent 1-7 road trip. On the mound, the Mariners got all they could ask of their starter, 26-year-old left-hander Jason Vargas, and a three-headed relief effort of Sean White, Mark Lowe and David Aardsma. Vargas scattered seven hits and three walks through 5 1/3 innings, burned only by Jason Varitek’s sacrifice fly in the second inning and J.D. Drew’s leadoff home run in the fourth. Vargas escaped a potential nightmare in the second inning when he essentially got five outs, thanks to Yuniesky Betancourt’s throwing error on a potential inning-ending double-play grounder. Vargas gave up a run in that inning but left the bases loaded when he got Jacoby Ellsbury on a grounder back to the mound for the third out. The Mariners followed that great escape with three others to keep the score close. Adrian Beltre began a highlight-reel double play in the third when he dived to his left to stop a hard smash by Mike Lowell. Two innings later, Vargas got Lowell to ground into a double play that ended another Red Sox threat. And in the sixth, after White relieved Vargas, Varitek grounded into a double play to end another Red Sox scoring chance and keep the score tied 2-2. Then the Mariners took themselves out of a chance to score in the bottom of the sixth when they literally walked into their most bizarre double play of the season. With Vladimir Balentien on first base on a one-out error, Rob Johnson noticed Lowell playing deep at third base and tried to drop a bunt up the line. The pitch from Red Sox right-hander Justin Masterson ran so far inside that it hit Johnson’s fingers near the barrel of the bat. The ball dribbled in front of the plate, where Varitek pounced on it and threw to first to get Johnson on what became a sacrifice bunt because Balentien reached second. That’s where confusion, and outs, reigned. Johnson took two steps out of the batter’s box and stopped because his right index and middle fingers hurt so badly. Balentien, seeing that Johnson stopped running, assumed the ball had rolled foul and started walking back to first base. The Red Sox alertly threw back to second and tagged him out to end the inning. E—N.Green 2 (8), Y.Betancourt (6). LOB—Boston 9, Seattle 9. 2B—Varitek (9), Y.Betancourt (5). 3B—Cedeno (1). HR—J.Drew (6), off Vargas; Branyan (9), off Masterson. RBIs—J.Drew (20), Varitek (16), F.Gutierrez (16), Branyan (19), Cedeno (2). S—F.Gutierrez, Ro.Johnson. SF—Varitek. RLISP—Boston 6 (Ellsbury 2, Lowell 2, Varitek, Pedroia); Seattle 5 (Beltre 2, I.Suzuki, Cedeno, F.Gutierrez). RMU—I.Suzuki, Griffey Jr. 2. GIDP—Lowell 2, Varitek, Beltre. DP—Boston 2 (N.Green, J.Bailey), (Varitek, J.Bailey, J.Bailey, N.Green); Seattle 3 (Beltre, Cedeno, Branyan), (Y.Betancourt, Cedeno, Branyan), (Cedeno, Y.Betancourt, Branyan). IR-S—Delcarmen 1-0, Okajima 1-0, White 2-0. IBB—off R.Ramirez (I.Suzuki). T—3:03. A—40,833 (47,878).